First, some Costco rotisserie chicken facts, shall we? Just the fact, Big Red Car, nothing more. 1. Costco sells 87,000,000 chickens a year. What? Yes, dear reader, Costco (741 stores) sells a lot of chicken — that’s about 157,000 per day. 2. They sell them for $4.99/chicken and have for more than 25 years. So, as you can see, there has to be something going on if they’ve held the price for more than twenty-five years, no? 3. Costco says they lose money on every single cotton pickin’ chicken. 4.They estimate they lose about $30-40,000,000 per year on their rotisserie chickens. Why do they do it, Big Red Car? 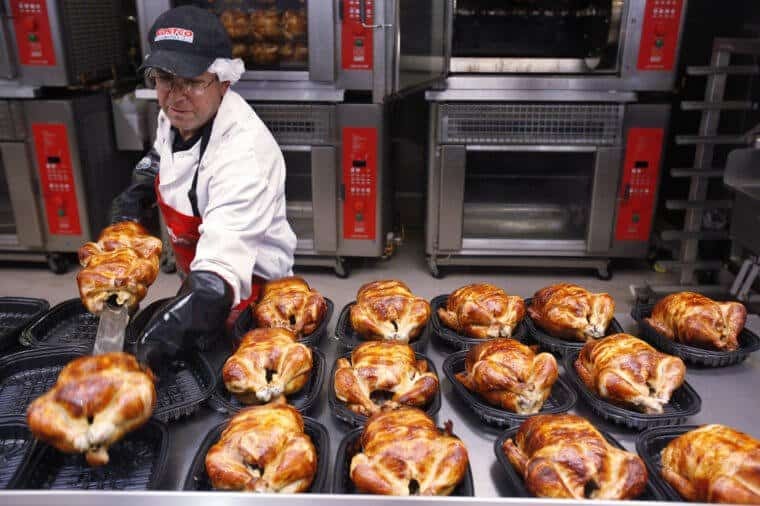 The answer, dear reader, is Costco believes that the $4.99 rotisserie chicken builds traffic to its stores and that while therein, the Costco customer never leaves empty handed. The Costco customer buys some fruit, a bottle of wine, some white tube socks, a package of micro-fleece towels, , a set of socket wrenches, and the large economy size of toothpaste. So, they see the Costco rotisserie chicken as a traffic builder, a buzz maker, a PR stunt, and a wise bit of marketing. It is a story and marketing is about storytelling, no? It is also a commentary on Costco’s culture — sending a clear message that Costco is dedicated to delivering value, is managing profit margins and not pricing things based on what the market would bear. All of this by taking a $0.50/chicken poke in the chicken thighs. Really, Big Red Car, that easy? Yes, dear reader, but Costco is not ignoring good business. They are currently building a $300,000,000 chicken-processing plant in Nebraska which will drive their costs down while delivering more than 2,000,000 chickens to their store-located rotisseries a week. If you are a CEO, I challenge you to find a parallel marketing initiative in your startup. What is it? What could it be? But, hey, what the Hell do I really know anyway? I’m just a Big Red Car. Good week, y’all! Oh, last thing — did you know that Costco has a $1.50 “hot dog and drink” deal which has been stuck at that price since 1985? Haha, now you do. This entry was posted in CEO, marketing and tagged Costco, Costco rotisserie chicken. Bookmark the permalink.